Captain Phillips tells the real life story of merchant mariner Captain Richard Phillips, who was taken hostage by Somali pirates in the Indian Ocean during the Maersk Alabama hijacking in 2009 led by Abduwali Muse. The most noteworthy aspect of Paul Greengrass’ canon is his ability to create immediacy, which is the key ingredient in Captain Phillips. The surface explanation behind Greengrass’s crackling visual style is simply that he shoots handheld. The truth is much more complicated than that. What’s behind Greengrass’ method is not merely the shaky cam, but his ability to create reality and punctuate immediate tension in his dramatic filmmaking. He understands that people receive information in fragments all the time and has found a way to incorporate that human reflex into a cinematic experience. So even with the fast cuts and shaky photography, the audience is able to follow what’s going on. It is emotionally connective. The set pieces in the first half of the film are visceral and tense. They feel like they’re happening right before us and we are immersed into the crew’s helpless dilemma. There’s a significant genre shift in the second act, as the film becomes a rescue mission procedural. It goes on a bit long by the end. The first half is definitely more fun than the second half, if only because the crew members become less active in the latter portions. Tom Hanks plunges into the title role in a way I haven’t seen in years. The trademark Tom Hanks movie star charm is removed and what remains is Hank’s everyman quality. 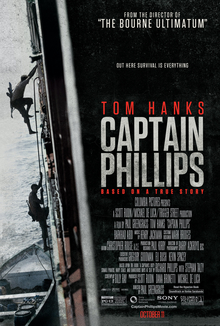 Captain Richard Phillips comparatively is a relatively colder character compared to Hank’s past roles, which frees him up to embody the role. The last few moments of Hanks’ Captain Phillips in shock dealing with the aftermath is breathtaking. It’s a great human moment, though overall the entire performance is probably not Oscar worthy. The Somali pirates are well casted. It’s baffling how the filmmakers found these actors in a cating session in North Carolina. They rise above their skinny appearances and rough-hewn looks and each individually play dimensional characters. Greengrass builds an interesting group dynamic between them and gives them a backstory that suggests that they are not intentionally evil people. Something noteworthy is how Greengrass depicts the military in a cold neutral fashion that doesn’t take political sides. They aren’t glorified like they are in Michael Bay films. The military here is functional and follows procedures to get the job done. There’s a lot of room for audiences to bring in their own views about the response time of the coast guard, the military’s handling of the rescue or the harsh circumstances of the Somali pirates. Although interested in world issues in a journalistic fashion, Greengrass isn’t overbearingly preachy in any sense. His focus is the drama and fully delivers on that.